Evil people prey on the weak and gullible. Kaiji is a story of gambling, but it’s even more a story of what happens at the margins of society. It is about the desperation of those without money, and the selfishness of those who have lots of it. Make no mistake, this is not a comedy, nor is it a “feel good” story. Most episodes had me feeling like I wanted to punch someone. This review is based upon seeing the entire series (26 episodes), but is spoiler-free. I really enjoy psychological strategy shows, shows in which we get to follow the thinking of participants as they plan their moves and struggle for success. An excellent recent series of this type was Ookiku Furukibute (Big Windup). 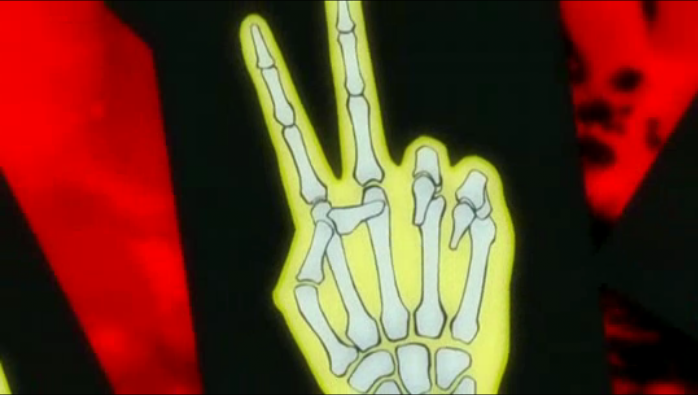 Now that OoFuri season 2 has ended, I wanted to watch another show of this type. Fortunately I had read a review by Shinmaru of Kaiji and another series based on a gambling manga by the same author (Nobuyuki Fukumoto). 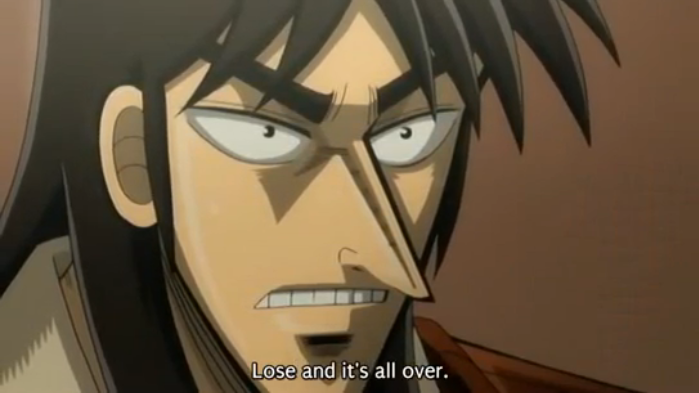 Kaiji is a hapless loser who doesn't want to cast aside his humanity. 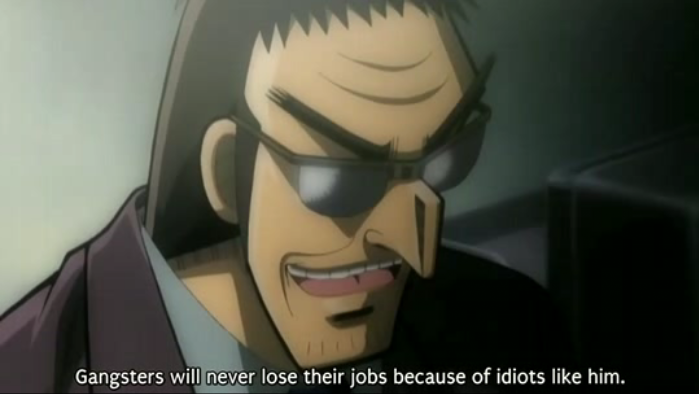 Kaiji, the main character, starts off somewhat despicable. He is drifting through life, and he takes his frustrations out in the very petty way of stealing hood ornaments from foreign cars. He is quickly trapped by his intemperate nature and his belief that a quick easy fix will solve his problems. He soon finds himself gambling on a boat ironically named Espoir (hope), where the price of failure is his life, but, if he plays correctly, he might have his debts erased. The real treat in this show, beyond the strategizing to survive the games, is the way Kaiji matures. He grows to realize the brutal nature of human behavior when trapped in a place ruled by greed, and what is most precious (and easily lost) about living. 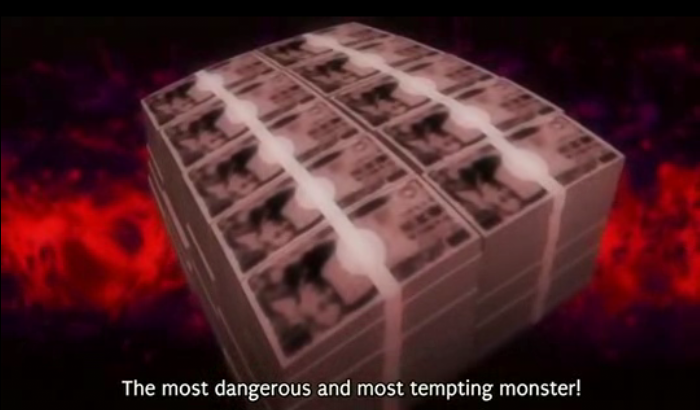 Usury isn't Kaiji's only problem. Stories about the yakuza trapping ordinary and gullible people are far from new. However, I found a freshness in the villains of the story, or perhaps I should say contemporary relevance. As I write this, the global economy has still not recovered from the financial meltdown of late 2008, tar balls are washing up further away from the scene of the Deepwater Horizon explosion than ever before, and a record heatwave is punishing the north-eastern coast of the United States (hitting 100F, here in Boston). The thread that runs through all of this is an obsession with snatching at “quick and easy” sources of money, rather than taking responsibility for the risks and eventual payment that come along with these quick sources of easy money. The 2008 economic crisis was caused by a variety of behaviors, but from the home-buyer who couldn’t afford his purchase, to the banks who calculated that real estate prices could never go down, to the investors worldwide who bought complex “financial products” that they didn’t understand, it all boils down to trying to get something without having to work hard for it. BP’s colossal oil spill in the Gulf of Mexico has revealed that the oil industry, the most profitable industry on the planet, has invested NOTHING (literally NOTHING) in developing techniques and technology to prevent and clean up such disasters since the Exxon Valdez spill in 1989. Finally, the world faces the global crisis of Climate Change, and yet powerful voices still say it would be too expensive to do something about the problem; instead political and business leaders are content to gamble on easy profits, with no concern about the serious price that will be paid as the Climate Change debt comes due. I’m really glad I followed up on Shinmaru’s suggestion and gave Kaiji a watch. It exceeded my expectations, and, although the story provoked frustration and other unpleasant emotions, I thoroughly enjoyed it, and would recommend it to those looking for a gripping drama. Yeah, Kaiji is fantastic. Glad you liked it so much. Akagi is also good, but it’s much more of a straight thriller than Kaiji … really, it’s basically Golgo 13 with mahjong, as in all the fun is in how Akagi will eviscerate his opponents rather than the suspense of whether he will be able to do so. 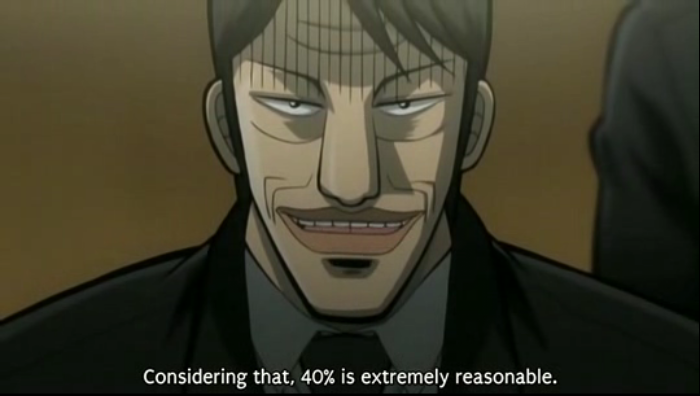 I’ll definitely consider watching Akagi sometime, because Kaiji was a very inventive story. I would be interested in seeing how the same author handled something else.